DocuSign is more than a signature. It's the key to your digital transformation. DocuSign allows you to quickly and securely make every agreement and approval digital, from almost anywhere in the world, on practically any device. It’s simple to use and implement, so even complex workflows can be quickly automated, keeping your business moving forward, faster. DocuSign eliminates paper and automates the agreement process, allowing companies to measure turnaround time in minutes rather than days. DocuSign’s intuitive user experience and simple implementation enables you to accelerate transactions and reduce manual paperwork from day one. We’ll provide hands-on, expert support to guide the success of your digital initiatives every step of the way. 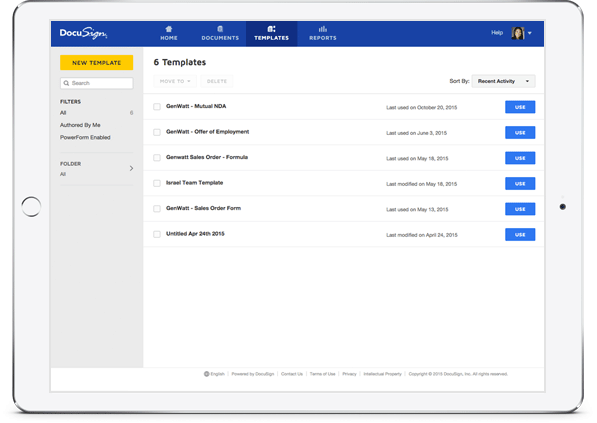 Get up and running immediately with DocuSign’s best-in-class eSignature application or connect to your existing systems with over 300+ pre-built integrations. And with our industry-leading eSignature API, you can build custom, end-to-end workflows. With highly secure encryption standards, 99.99% platform availability and complete digital audit trails, DocuSign gives you total confidence in every transaction. 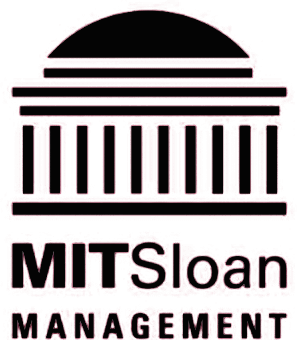 More than 370,000 customers and hundreds of millions of users worldwide rely on our platform to execute and protect even the most sensitive transactions. And for customers looking for on-premises signing for regulated industries and markets, we offer the DocuSign Signature Appliance. Prepare documents. Integrate data. Define workflows. 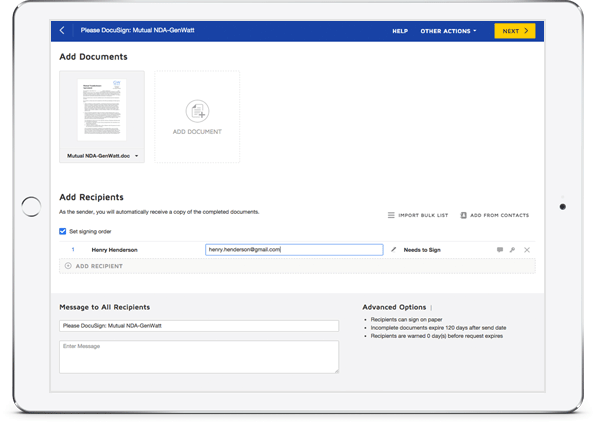 With DocuSign, you can easily prepare agreements using your existing documents and data from other systems—no need to create new forms or rekey data. Flexible workflow capabilities let you share agreements with the right people in the right order and define roles for each recipient, automating what used to be a slow, manual process. We ensure signers are who they say they are using advanced authentication methods to match your needs. Your customers can quickly sign legally binding contracts from practically any device in 43 languages, while providing other key data like phone number or credit card to complete the transaction. Plus, you can standardize and scale all of these processes across your teams or entire organization and brand the experience for your users. Get instant visibility into the status of every digital agreement and full reporting functionality across your organization—no more “blind spots” in your transactions! Even manage multiple accounts, users, and permissions with ease. 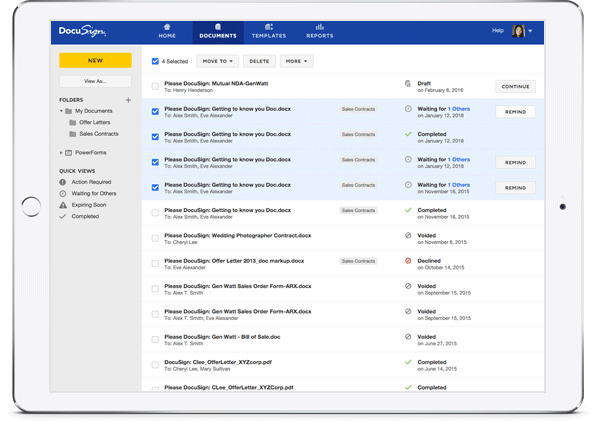 Securely retain documents and data in the DocuSign cloud, or transfer to your own systems with the complete digital audit trails to ensure compliance and confirm the validity and legal enforceability of all transactions. How will your business DocuSign? Streamline document-driven processes across your entire organization. See how easy it is to sign documents. Get your free 30-day trial.